Add a modern touch to your kitchen with the TopZero Oslo Sink. This single kitchen sink is made of 304 stainless steel and coated with satin. Since this is a single kitchen sink, it adds style and simplicity to your kitchen. Made by TopZero, this sink is rimless and modern. Are you looking for a single kitchen sink that will complement your modern kitchen in Barbados perfectly? 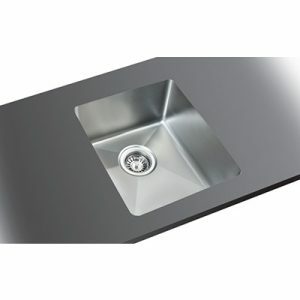 If so, there’s no better option than this stainless steel undermount kitchen sink by TopZero. Like all of TopZero’s unique sinks, the Oslo Sink is made to be rimless. This modern, single kitchen sink is beautiful and designed to eliminate the buildup of grime and scum around the rim. This sink is also equipped with absorbing pads on the exterior, and it is coated with premium aluminum. Order yours with us at Fiberpol today!